There is an extensive discussion about this power supply providing improvements. You can follow the discussion or you can see latest data in this topic. This is a high quality power supply with a continuously variable stabilised output adjustable at any value between 0 and 30VDC. 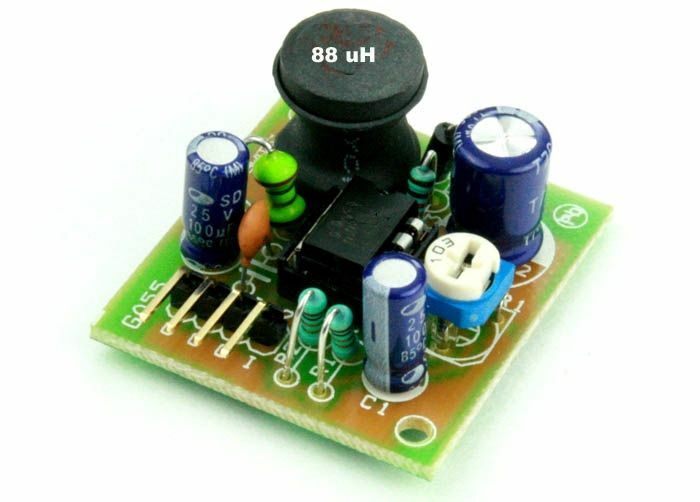 The circuit also incorporates an electronic output current limiter that effectively controls the output current from a few milliamperes (2 mA) to the maximum output of three amperes that the circuit can deliver. 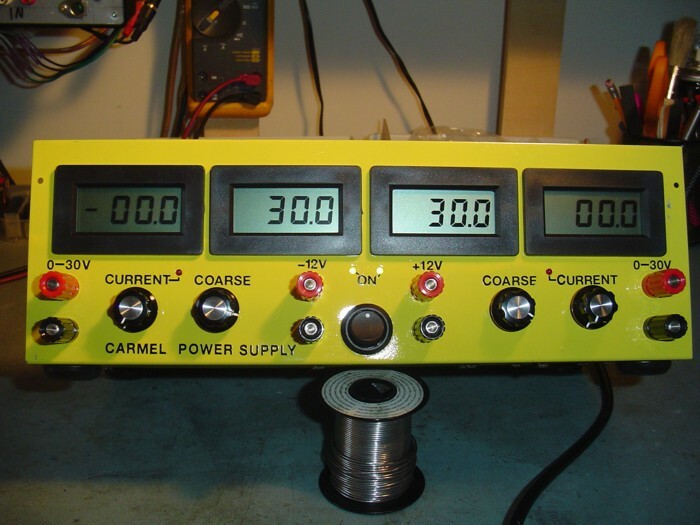 This feature makes this power supply indispensable in the experimenters laboratory as it is possible to limit the current to the typical maximum that a circuit under test may require, and power it up then, without any fear that it may be damaged if something goes wrong. There is also a visual indication that the current limiter is in operation so that you can see at a glance that your circuit is exceeding or not its preset limits. Reduced dimensions, easy construction, simple operation. Output current limiting with visual indication. Complete protection of the supplied device against over loads and malfunction. To start with, there is a step-down mains transformer with a secondary winding rated at 24 V/3 A, which is connected across the input points of the circuit at pins 1 & 2. (the quality of the supplies output will be directly proportional to the quality of the transformer). The AC voltage of the transformers secondary winding is rectified by the bridge formed by the four diodes D1-D4. The DC voltage taken across the output of the bridge is smoothed by the filter formed by the reservoir capacitor C1 and the resistor R1. The circuit incorporates some unique features which make it quite different from other power supplies of its class. Instead of using a variable feedback arrangement to control the output voltage, our circuit uses a constant gain amplifier to provide the reference voltage necessary for its stable operation. The reference voltage is generated at the output of U1. The circuit operates as follows: The diode D8 is a 5.6 V zener, which here operates at its zero temperature coefficient current. The voltage in the output of U1 gradually increases till the diode D8 is turned on. When this happens the circuit stabilises and the Zener reference voltage (5.6 V) appears across the resistor R5. The current which flows through the non inverting input of the op-amp is negligible, therefore the same current flows through R5 and R6, and as the two resistors have the same value the voltage across the two of them in series will be exactly twice the voltage across each one. Thus the voltage present at the output of the op-amp (pin 6 of U1) is 11.2 V, twice the zeners reference voltage. The integrated circuit U2 has a constant amplification factor of approximately 3 X, according to the formula A=(R11+R12)/R11, and raises the 11.2 V reference voltage to approximately 33 V. The trimmer RV1 and the resistor R10 are used for the adjustment of the output voltages limits so that it can be reduced to 0 V, despite any value tolerances of the other components in the circuit. Another very important feature of the circuit, is the possibility to preset the maximum output current which can be drawn from the p.s.u., effectively converting it from a constant voltage source to a constant current one. To make this possible the circuit detects the voltage drop across a resistor (R7) which is connected in series with the load. The IC responsible for this function of the circuit is U3. The inverting input of U3 is biased at 0 V via R21. At the same time the non inverting input of the same IC can be adjusted to any voltage by means of P2. Let us assume that for a given output of several volts, P2 is set so that the input of the IC is kept at 1 V. If the load is increased the output voltage will be kept constant by the voltage amplifier section of the circuit and the presence of R7 in series with the output will have a negligible effect because of its low value and because of its location outside the feedback loop of the voltage control circuit. While the load is kept constant and the output voltage is not changed the circuit is stable. If the load is increased so that the voltage drop across R7 is greater than 1 V, IC3 is forced into action and the circuit is shifted into the constant current mode. The output of U3 is coupled to the non inverting input of U2 by D9. U2 is responsible for the voltage control and as U3 is coupled to its input the latter can effectively override its function. What happens is that the voltage across R7 is monitored and is not allowed to increase above the preset value (1 V in our example) by reducing the output voltage of the circuit. This is in effect a means of maintaining the output current constant and is so accurate that it is possible to preset the current limit to as low as 2 mA. The capacitor C8 is there to increase the stability of the circuit. Q3 is used to drive the LED whenever the current limiter is activated in order to provide a visual indication of the limiters operation. In order to make it possible for U2 to control the output voltage down to 0 V, it is necessary to provide a negative supply rail and this is done by means of the circuit around C2 & C3. The same negative supply is also used for U3. As U1 is working under fixed conditions it can be run from the unregulated positive supply rail and the earth. The negative supply rail is produced by a simple voltage pump circuit which is stabilised by means of R3 and D7. In order to avoid uncontrolled situations at shut-down there is a protection circuit built around Q1. As soon as the negative supply rail collapses Q1 removes all drive to the output stage. This in effect brings the output voltage to zero as soon as the AC is removed protecting the circuit and the appliances connected to its output. During normal operation Q1 is kept off by means of R14 but when the negative supply rail collapses the transistor is turned on and brings the output of U2 low. The IC has internal protection and can not be damaged because of this effective short circuiting of its output. It is a great advantage in experimental work to be able to kill the output of a power supply without having to wait for the capacitors to discharge and there is also an added protection because the output of many stabilised power supplies tends to rise instantaneously at switch off with disastrous results. 1 & 2 AC input, the secondary of the transformer. 3 (+) & 4 (-) DC output. 5, 10 & 12 to P1. 6, 11 & 13 to P2. 7 (E), 8 (B), 9 (E) to the power transistor Q4. The LED should also be placed on the front panel of the case where it is always visible but the pins where it is connected at are not numbered. to disconnect it if something looks wrong. Make sure that all the polarised components have been soldered the right way round. – Make sure the supply has the correct voltage and is connected the right way round to your circuit. You can post your experience and thoughts building this power supply in this topic. Daniel’s build of PSU – internal view. He is going to change 2200uF a 6800uF capacitor to reduce ripple in high load. Ok. I bulid your project about a day ago. Mounted all the parts on the pcb and then concluded that there is some serious problems in this schematics. First, 2N3055 will overheat, so you have to connect two of them in parallel with emitter resistors 0.1ohm/5w. Second, maximal voltage between ‘+’ and ‘-‘ of TL081 is 36VDC.If you connect them as it is shown in this circuit diagram that voltage will be about 45VDC, so they will burn down immediately. To fix this problem you have to reconnect all pins number 7 of U1, U2 and U3, emitter of Q3 and ‘upper’ end of R19 to out of an 7809 with 18V zener diode between ‘common’ pin and ‘-‘ of 3300uF cap, and input of 7809 connect to ‘+’ of the same cap. Now, on pin number 7 and mentioned parts you’ll have 27VDC, and total voltage will be 32.6VDC. Third, instead of using 3300uF, use 4700 or 6800uF/63VDC to reduce the ripple on higher currents (2-3A). The rest of the circuit is perfect. I like it cause it is so inexpensive and easy to make with those simple reconstructions i mentioned. A great addition to your PSU would be a Voltmeter + Ammeter LCD panel. Check it here! Are there any ready made pcb’s with no components mounted, available for this project ? 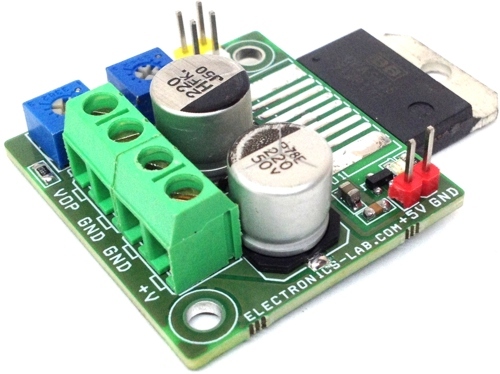 You a slightly modified version of this power supply as a kit from Banggood for about 10 bucks. The project code is SKU179821. Yes a ready made PCB with components is available at ali express in cheap price . please search with same name of this article on ali express. Did any body built this and were functional ? 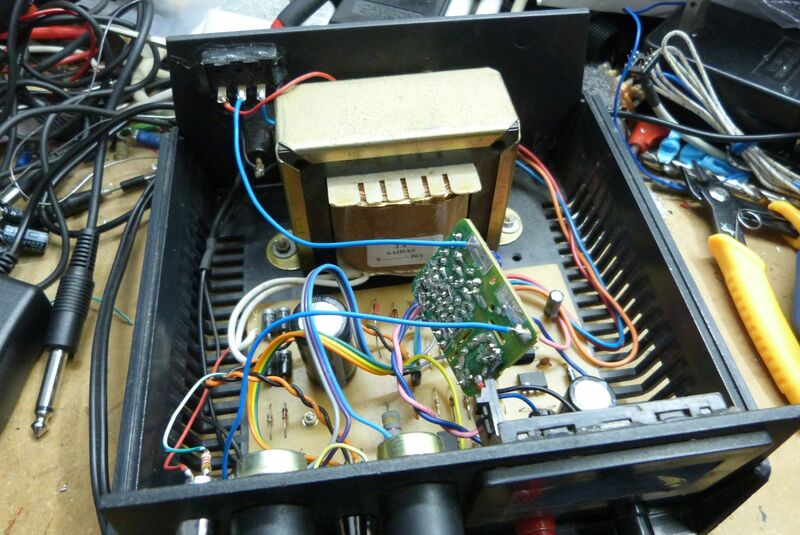 I have been using this excellent power supply that I constructed since 1982. more than 30 years! It works well. You need to be an experienced electronic constructor for this circuit due to the polarities of diodes and zener diodes, transistors etc. What is the result when you switch your unit on? Descrivbe the problem, maybe I can assist. Do you have a electronic background? 0.002-3 A – Electronics-Lab <Loved it! What is the purpose of the 18V zener proposed by Ivan ? The 18V zener seems to have no effect. An 18 volt zener in the ground leg of the 7809 raises the output voltage to 27 volts regulated. Ivan’s proposal burned the 7809. It regulates it for a while until it eventually burns up and melts its own pins off. The circuit must be connected to 24V alternating current power, and direct current is forbidden. i was not thinking clear and tried testing it with a dc psu..
You MUST have -5v on the negative rail. It’s mandatory for this schem. What’s the software you used in designing this board?? I see that the transformer used in the picture is labeled 24V 3A and that the design is for a 3A capability to the load. Has this arrangement ever been tested for full 3A output at 30Vdc?? It’s been my experience (many years) that a good rule of thumb for transformers is that under rated load the rectified and filtered voltage will be about the same as the transformer specs. That is, the dc output from a full wave rectifier and filter will be 24vdc with a 3A load when using a 24V 3A transformer. It seems to me that a transformer with a higher current rating must be used in order to achieve 30Vdc at 3A. After all, the supplied voltage must always be higher than 30Vdc if one wants 30Vdc out. Which voltage regulator do you mean? Can I get calculation for this project? Hi. I built this power supply. I have a problem. To bring the voltage to zero, increase to the maximum value (40V). That may be happening? I also build and finish this project but when power is on the voltages is stay at 34v and all controls are not function P1, P2 even the VR1 is disable. can you please help me any suggestion for this is appreciated. 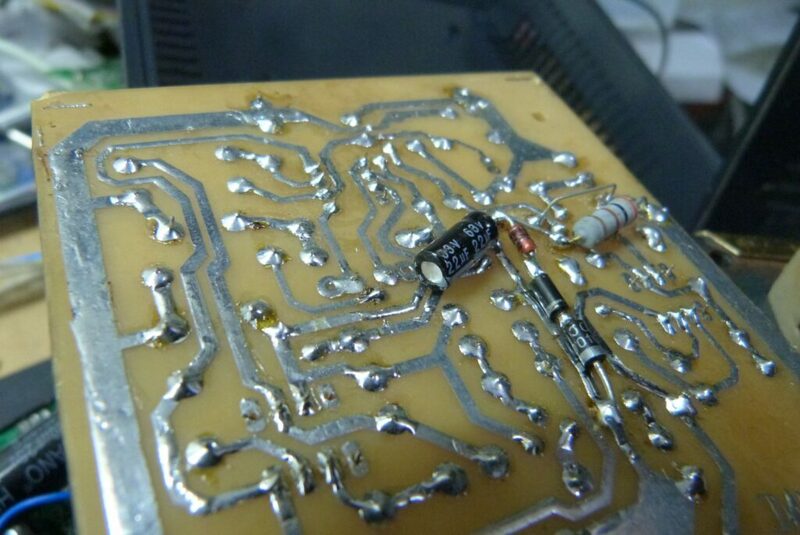 recheck Q2 = 2N2219 NPN transistor position. confirm emmiter to 2n3055 base. Hey can i ask you if you find a solution for this problem because i have the same error. What is the pcb size? Please tell me what the printing size of pcb. Brother if i download the above image file of the pcb and resize it to 8.5cm x 12cm would it work for me??? Quality is nice you’ve put a nice project on internet. Sure, try it by fitting an ic to it’s socket. Can we use a 3 A bridge rectifier instead of D1, D2, D3, D4 ? plz reply ? 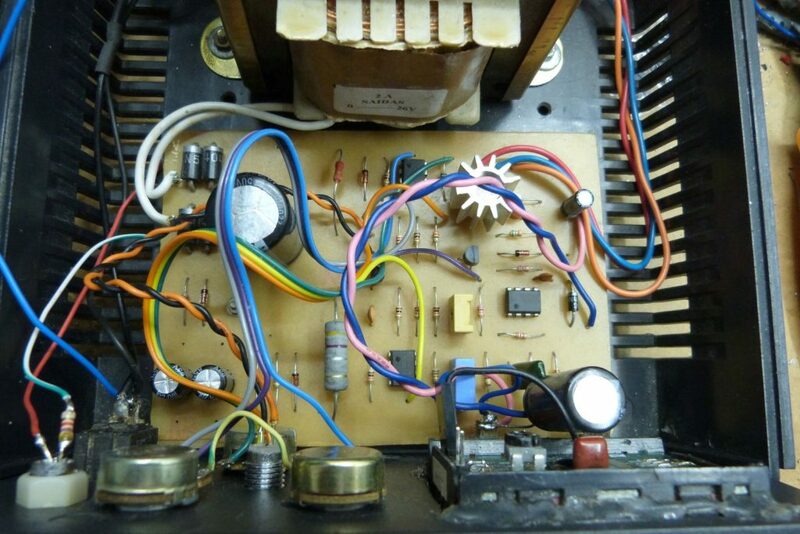 Sure, just remove the diodes and make sure you connect the bridge rectifier the correct way. Can this circuit be modified to generate 0 to -30VDC? Do you have a recommended circuit to generate negative voltage?0 to -VDC. I have power supply 24 volt /5 amp and I want to make current control circuit 0:5 amp for it. I did everything an my setup does not working. HI i made the above supply and i got an output around 25V but My potentiometers dont seem to work at all. I can neither vary current nor the voltage. Can anyone suggest me a possible problem,,,….with my circuit. There are reports that this power supply works. I suggest you to follow the PCB design and not the schematic itself. Please also check all your connections and parts placement. With the TL081 OPs the circuit will not work reliably with a transformer of more than about 20 V. The maximum voltage will be somewhere near 24 V then. For getting 30 V, one needs an OP that can withstand a higher supply. At 3 A current chances are the output transistor will blow up – check the SOA diagram of the Transistor and use some derating for not so perfect cooling. So the 3 A might be OK with a 15 V transformer. Could you provide the pcb layout for above circuit? If anyone would like just the pcb to be built please contact me I can do it for you. We are sorry, we don’t sell PCBs, but you can find a kit of this power supply on ebay. We are sorry, we don’t sell PCBs of this project, but you can find them on Alixepress. If I want to limit the maximum current to 1A or 2A – how can I do this? Choose a 30V 1A transformer. If shorted it can only deliver 30W for dissipation at Q4. You will need to experiment with the values of R17, R18, P2, to ensure that P2 cannot command more than 1Amp which would cause the transformer to overheat. Bought two kits from Aliexpress one works well ! ! The second raises not go 12 volts. . . I found fixes the problem. .
27 KOhm 27O KOhm Placing WRONG. .
how could you hope to have 30v Dc from 24v dc with a linear regulator? magic? The comments are right, that is a seriously overhyped output. Doubling the 2N3055 and using a 7809 or similar to get 27V to run the OPs is a great idea. However, U2 will then not be able to drive the OP stage much higher than about 18V or so under max current conditions. I think with the right caps (2x6800uF or so) on a 0-30V 3A transformer, plus a different (i.e. expensive) choice of opamp [run from GND to the unregulated supply of about 44V] that can drive output close to those rails, it could actually do 30V @ 3A. I did wonder about drive for the pass transisters if doubling up. However two transistors would only be sharing the current to assist in heat dissipation. Then I would expect lower base current for each transistor. So when ‘n’ma is needed for one transister then each of a pair would need ‘n/2’ma each so no change. I will breadboard this first before cutting metal. yeah, however, Ivan’s email for adding 7809 just melts its own legs off. Is there any way to share the load even more (besides doubling 7809)? voltages is stay at 34V when power is on. P1, P2 and RV1 are disabled. any suggestions for this is apprecieted. Please double check your connections and parts orientation according to PCB layout. Also check the Q2 and Q4 for fault. in this ckt aux supply of tl081 …near about 39 v & in spec.. +- 18 is it right? your circuit is same as published here or any modification is there.what type of ic and transistor you have used. My PSU journey. Starting with the banggood kit. First I put to one side the rectifier diodes, op amps, pass transistor and smoothing cap. My transformer was a 12.0.12 toroid at 6A. I paralleled both outputs to give 12 amp headroom. The rectifier diodes were swapped from 3 to 10amp devices and all op amps replaced with devices from quality suppliers (RS etc.). The smoothing cap is a pair of Rubycon ZL 2200uF in parallel. The pass transistor was swapped for a pair of tip3055s and 0.01ohm 3W balance resistors on a 1.2c /W heat sink. A 5A NTC was added to control switch on surge with the low ESR caps. I have yet to mod the current limit to max out at 5A but everything works fine so far. My thinking was that 99% of all experimentation is done at 12v or less and usually around 1A, so why build to 30v? I have loads of headroom, a cool supply and something that should be reliable. 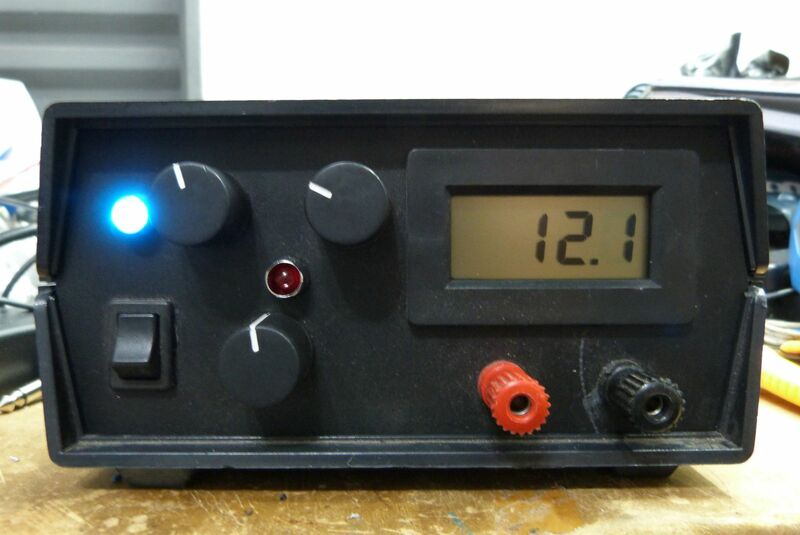 You can add a digital voltmeter like this one: http://www.electronics-lab.com/project/led-display-digital-voltmeter/ or http://www.electronics-lab.com/project/digital-panel-meter-dpm-dvm/ This meter is connected in parallel to the output of power supply. OK, I got this running. 0-30V 100W transformer (should have got a 120W – the 100W is a little out of spec at full output 30V@3A, as the drive circuitry soaks up about 20W or so). A big cap is needed to reduce ripple at full output. I used 2 x 6800uF caps. A 10000uF would have done, but I got the 2 smaller caps cheaper. This gives (unloaded) 46V DC, at rated (3A) output that should be 41V DC. D7 is replaced by 2 x 1N4148 to get a -1.3V negative rail. No need for any more volts. U1 & U3 are run from a zener diode connected to the unregulated +ve supply, a 15V zener drops the voltage plenty enough. Q3 & R19 use the same zener as U3. U1 pin 4 moved to pin 4 (junction of R7/C7). Q4 is doubled up, adding 0.1Ohm 3W emitter resistors. U2 is a MC33171, it is within spec with the unregulated DC supply and was quite cheap for me to buy. R10 is a wire link for this opamp. U1 & U3 are TL071, no particular reason, any old cheap utility opamp will work, 741s, anything. The Q4s are on a big heatsink sat outside the project box. 1.5C/W I would say is minimum. Can you share the updated schematic please. Yes, almost identical to schematic in the first post in that thread. Except I ran U1 from its own 15V zener, as my U1 is a TL071 and the unregulated +46V DC is a bit much for it. Also I changed R13 & R14 like the schematic in 1st post, to account for -1.3V rail. With a TL071 for U3, I used 4 x 1N4148 to get -2.6V. With only -1.3V the output of U3 did not go low enough to correctly current limit into very low resistance loads (e.g. short). I build this Power Supply yesterday and my current control does not work. I checked for shorts and dry solder joints. What can caues this Problems, pls help. Did you used a load to test the power supply operation? Yes I used a 60 Watt Car Lamp, and I found my mistake. For R17 I accidentaly used 33k Ohm and not 33 Ohm. Now it workes great. Just like I hoped, and for sone reason the maximum output current is 4,5 amps, bit thats is not that bad, because I use a 15V 5A Transformer. This design really needs about 0.7deg/W for Q4 on 3A@30V output into a short. With a fan on the heatsink you get away with a smaller one as I did (1.3deg/W). 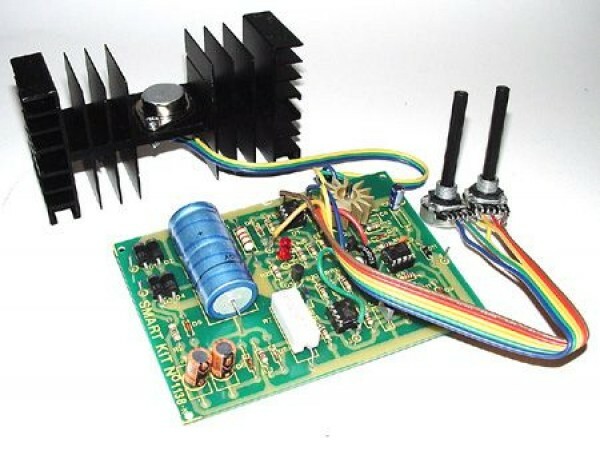 To be properly rated with a passive heatsink… that is a big heatsink. If you go to between 6A – 10A you also need to cool the bridge rec, make careful choice (maybe even two trans in parallel) of Q2 (2N2219 is not high power, Q2 needs to handle around 10W if output is 10A) and its heatsink will be significant. The main heatsink for your Q4s will need to be suitably large, almost certainly actively cooled, at which point thermal protection becomes a very desirable feature. Probably some other detail changes needed too. i’ve fond in the net two separate diagrams of this power supply with different zeners and diode values 5.6v against 5.1v, 1N4004 against 1N4001 ! what should i retain to realise this power supply ? thank you for your help. sit is that this supply have short short circuit protection ? 1. Which opamp can be used instead of the TL081 due. Supply up to 47V. 2. U3 should I have to work with a smaller voltage. Can someone please explain me how U1 works? I am having 0 volts at pins 2, 3 and 6. It should start raising voltage at pin 6 until D8 conduct, but it happily stays at 0V. Using 5532 there – I tried few new, all works the same (I mean, it is not broken). What voltages should appear on pins 2, 3 and 6? Pins 4 and 7 are on power supply, 0V and around 35V. No short connections, everything seems fine. check again for correct connections, and/or try it with R18 and P1 removed. BTW 5532 is a dual chip, pinout is different, pin 1 is OP, pin 2 is inv IP, pin 3 is non-inv IP. You know that I assume. Thanks! I’ve put those 5532 on a protoboard and found a defective 5532. Not used before. Probably it comes from Chinese production. I have a question about this power supply. I am attempting to create a pulsed DC current suitable for electroplating. One of the issues with ripple and that creating pulses tends to make voltage spikes in a constant current rectifier. I’ve tried a simply chopper circuit bench power supply hooked up to the anode with limited but promising results. I’m theorizing its these voltage spikes keeping it from being ideal. Would this type of power supply avoid these spikes due to its constant gain amplifier? Could something like this be modified to deliver pulsed DC current? Thanks in advance! I built this project and it is working from 19 to 27 volts and the current limitation works, but I can’t find out why it does not go down to 0 volts. Could you give me a hint? Double check 2N2219 and 2n3055 (polarity and condition). 2n2219 at emiter goes from 0v to 10v, check this 0-10 at 2n3055 base too. Forgive my broken English, I use a translator. I read the long article on this project and I have some questions to ask your community. – Who managed to complete and test this project? – What is the % regulation (difference between load voltage and full load voltage)? – Which schematic would you advise me to use? – Is there a quirky available for burning? Regarding the voltage display and intensity, I have chosen them for their quality, precision and … the price! Does he mean there would be two of these power transistors (2N3055) connected in parallel on the same 7,8 & 9 connections (on the PCB-component design) and each of these would have an emitter resistor in their own respective parallel branches? Just need a little clarification before I completely fire up the PSU. You do not have to worry about heating if you use a really good computer’s cooler with fan. Remember, at full power, the power delivered is 90 watts. Someone asked about printed board – complete DIY kit with excellent 2 sided board on Aliexpress is under $7 with free shipping. I bought 2 and both are already in use. You need to add transformer and cooler (the one from old processors or graphic cards works the job, but just replace 7824 with 7812). Great stuff! I did exactly the same thing, bought a board at Aliexpress, put a transformer and a 7812 and is working perfectly. By the way, also build the project shown here. I have both versions running. I’ll post the photos of the assemblies. I had just built today this power supply using the schematic and pcb lay out and everything works fine,maybe you have a bad solder or some parts are wrongly placed, recheck all connections and all soldered points it should looks shiny if properly soldered. First: Isolate the power supply to the op amp. By connecting with a 7909 with a 16v zener on the common pin, connected to ground, so it arrives 25V in the VCC of them. Second change: I placed a 1n4007 before R2, so R2 gets half the voltage … There is no reason to use R2 before rectification. If you rectify before, R2 does not heat up. Third: You can put a 1K Potentiometer in series with the 10K voltage, so you can make a finer adjustment. But the project is very good, the filtering is very good, without any noise … I really enjoyed riding. hey dear, can you please tell me how to add fine volume for voltage and current ? I’ve tried simulating it on Multisim but couldnt get it to work. Checked the connections and all, not sure where the problem is. Can anyone give me their email and i’ll send the multisim design for u to check. I’ve tried simulating this power supply on Multisim but it’s not working. Output voltage equals 0 and it can’t regulated. Could you pleas help me ? Power supply was from a 25V transformer which delivers 42Vdc when rectified and not loaded. Add Minus 5.1V for the negative and The TL081 are supplied from 47V. They blow right away, this is why the negative supply then turns up to .8V as some have found. That in turns kills Q1. Very difficult to repair then. Cheap thing but a frustration. 42 V DC means around 30.5 V AC (29.8+0,7). That is one weird transformer that gives -6.5 V with just a little current as a load. I wonder what is voltage drop on 3A load then? I can not run with the simulator Multisim this project, but not even the original project. How do I attach the Multisim source here? lm741 op-amp will work as replacement?? Tried, but in Multisim does not work. LM741 should work as replacement. Thanks for your comment. Feel free to post your experiences building this psu on the community, this way you will help others that want to build it. Is there any problem if I use 6800uF & 50V capacitor as C1? C1 is a filtering capacitor, so a bigger value will do the job also. The last answer put yes when the should have put no. Yes you can use a 6800uF 50V it will work fine. That’s right, thank you for the correction! Edit : When a small load is connected the power supply only messes up if the current limiter is reduced (action done to confirm if the current limit is working). Do you tried to swap out D9 diode? I killed this power supply with a relay on it’s output! I changed Q2 and it started working again. What can I do to avoid damaging my power supply with relays? A relay always needs a backwards biased parallel diode.The collapsing magnetic field generates a negative spike, which kills the transistor.Google relay diode to see how exactly should it connected. And check the D11 for polarity.The role of D11 is protecting Q2, so if you connected it reversed, then it can not protect yout power transistor. Jan 2017 WARNING! Some of the kits currently being sold on eBay and Amazon have the small diode markings reversed. This naturally causes damage and the circuit will not work. As no circuit is supplied I wondered if this was a redesign but it seems that simply the making are plain wrong! I have trued to explain this to the sellers (who are Chinese) but they are simply not interested. Double and triple check the small diode marking before soldering. Hi Robert Philpot. Thanks for sharing this. Could you please specify which diodes that might have wrong markings. And is it the marking on the PCB or the actual diodes provided in the kit? A reference to the schematics on this web page would be great. Look out for BD139. Basically any medium-power transistor will do it. amp to 5 or 6 amp. Please could you send me the PCB layout in PDF form because when i printed it it looks ugly. Hi. 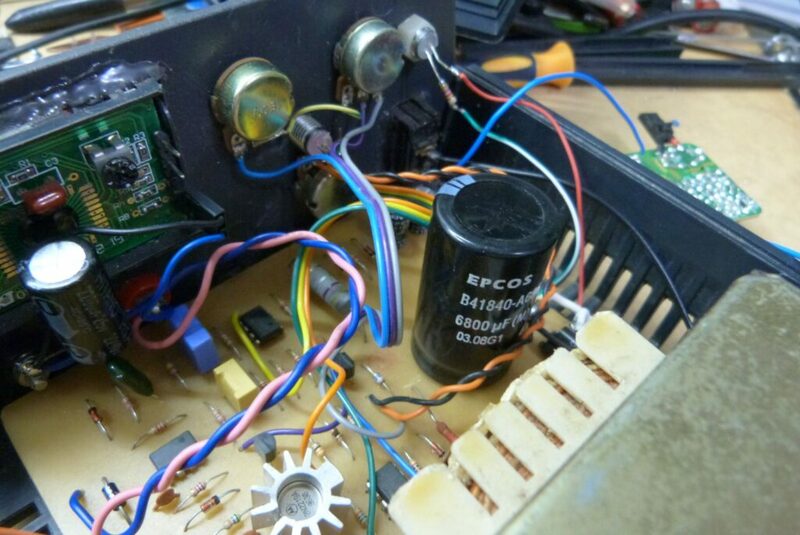 I make this power supply and added Ivan’s modifications without connecting two 2N3055 in parallel and everything were working fine (including short circuit protection). then i decided to add another 2N3055 in parallel but i did’t use 0.1ohm/5w resistor. after i turned it on i wanted to test short circuit. at that moment the LED didn’t turned on and the output voltage was equaled to 35V and it couldn’t get changed with P1. So can anyone help me?! My problem solve and when i was testing my power supply, i found out that i couldn’t control current. I test another motor and at that moment i saw that current is about 7 amps !!!!! Man, your PS needs to be fixed. Check Q2 and Q4, I think u just replace it and everything will be good. Hi guys, I’ve bought a kit for this PSU and assembled it. It works, at least for small currents, I’ve not yet attached proper heatsink to test it fully. But it has a small glitch. When caps are fully discharged, PSU doesn’t start, overload diode is on, output voltage is about -0.5V. If I then briefly disconnect and reconnect power, PSU starts working correctly. I’ve tried to poke around the circuit and check the voltages, it seems the issue is that output voltage of U1 pin 6 is around 0V . Attaching single multimeter probe to each side of D8 zener diode , so it’s not closed circuit, really just a 1m long wire not connected to anything, “fixes” the issue 🙂 Any idea how to implement proper fix ? If you can measure negative voltage on the output, thats not good.Check the diodes for polarity, especially D10. It seems the issue is caused by negative rail oscillations. I know, i should check that at the very beginning, but this is the first circuit I’m troubleshooting. I’ve captured it with a scope and uploaded it at http://imgur.com/a/wOmRt . It’s some kind of transient issue, because it occurs only when connecting transformer to AC while circuit is connected secondary. If I first connect transformer to AC and only after that PSU to secondary, negative rail is stable. The voltage of negative rail when oscillating is below zener voltage of D7, so increasing capacity of C2&C3 let’s say by 50% should fix the issue? And I have a feeling, that the R2 resistor could have an incorrect value, or the capacitor’s esr is too high.Maybe. Or if you’re out of ideas, you can swap out R14 to a 3.3v zener like on the czech schematic above. Please tell me i don’t found 1N5402 diode can i use 1N54008 instead of 1N54002. Can i use 3300uf/71V capacitor instead of 3300uf/50. And i didn’t found 0.47ohms/5w resiatance can i use 1ohm/5w. Sir pleaae help me and provide guidelines so i can build..
5408 withstand higher reverse voltage and both has same maximum current (answer is yes). 71V (71? are you sure?) 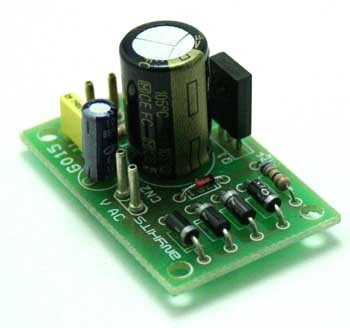 is more than 50V, that capacitor withstand higher voltage and it has same capacity. if it is older one, check it first, it may lose capacity over the years (answer is yes). You can put 2×1 Ohm in parallel and you’ll get 0.5 Ohm resistor (wattage sum up so it will be 0.5 Ohm 10 W – answer is yes). Please tell me cal i replace 1N4001 with 1N4007 diode. And replace 200nf polyster capacitor with 220nf. And when i add two resistor 1ohm5w parallel then watt will be 10w yet my circuit work efficiently.. Please tell me can I replace 1N4001 with 1N4007 diode. And can I replace 200nf polyster capacitor with 220nf. And when i add two resistor 1ohm5w in parallel then watt will be 10w then my circuit work efficiently or not.. Yes both are equivalent. You can replace with 4007.
please help me why u3 IC so hot and no output voltage ,and where should i connect RV1 ….can I use 220nf instead of 220..
No you can’t. Yo’re only capable of having 2 Amps out of the transformer. If you try full load on this unit with that transformer, either one them will die immediately..
Sir canyouplease tell me how to connect the 16×2 display with it? Sir , can you please gave me a diagram of dual usb 5v 1a and 2a output power bank circuit with 18650 battery charging option. does this source deliver -30V as well? No, it’s only for positive voltages. Great tutorial.Can I use one of the op-amps of LM224 IC in place of TL081 op-amp used in above circuit. What type of fuse should be used to protect the circuit? I would propose to use a fuse on the primary coil of the transformer. To specify it’s rating you can use a multimeter to measure the current while the power supply is giving it’s maximum output power. Then choose a fuse with rating above the measured current. -If it is unpowered and you connect the output leads to a power source, the 2N2219 will certainly die. This scenario is not so unlikely: Simply charging a battery and turning off the PSU before removing the charged battery, or a power outage while charging will destroy it. Do you have a diode connected in reverse on the output? I mean, the anode to negative and cathode to positive? I have no diode in reverse on the output, as negative voltage protection. I will add a relay, so when the PSU is not powered the output will be disconnected. This relay will be supply separately from the transformer, with an independent rectifier bridge and very low capacitange. How will it work? When charging battery, in case of a power outage the relay will disconnect the output leads before C1 (2x8100uF in my case) gets discharged. Also, I will change U1, U2, U3 to TLE2142 and put a 28V transformer. TL081 has only 36V maximum supply. 2N2219 will be replaced by 2N2204a (or BD139), 2N3055 will be replaced by 2x2n2055W. R8 and R18 will be modified (increased), R7 from 0.47Ohm to 0.22Ohm. I hope after all this it should be capable of delivering 0-30V 0-5A. And I suppose there will be no more problems, if a power source is connected to the output when the PSU is off. Can you tell me what is the feedback path of op-amp U2? Is it Q1-R7-D11-R12? What type of fuse should be used to protect the circuit?? That’s a good idea but I’d still use a diode. No harm in using one right? YES U CAN! But this power supply actually has some bugs. I’d much prefer buying a switched power supply module and use digital potentiometer with those, like LTC3780 module. Very cheap from China on AliExpress/Banggood. Hello Everyone, I’ve just bought PCB+parts kit from Banggood and I’m starting to build this power supply. I have 120VA transformer with secondary voltage 21VAC under load (~23VAC with no load). It’s clear that I cannot achieve 0-30V range but it’s not important for me. I did some calculation and I believe that I can achieve at least 0-24V range. Am I right? Any confirmation/advice please? Hi friends. In this circuit diagram , the U1, U2 and U3 connecting pin number is not clear. So anyone please send me a clear diagram . I can see OP-AMPS pin numbers on schematic above. Please save image as and open it on an image viewer. I’ve a question. This power supply is short-circuit?? what i mean is, if i link the outputs to ajust current turn P2 until multimeter show the current that i want? Yes, right. If you short the output then current regulation will take place and will limit the output current to the defined level. You can measure this current using a simple ammeter. If I can`t bought TL081 IC in market, what op-amp I should use. I have built this kit and tested it with oscilloscope under load . Also, I have built it in Multisim 14 simulator. In CC mode there are very high pulsations on the load with amplitude about 250 mV 100 Hz at 3A. In Multisim 14 I do not have such pulsations. When I return to CV mode, everything works fine and real pulsations are within 5 mV range at 100 Hz. I tried to solve the problem with high pulsations in CC mode by increasing C8 up to 100n, and this was helpfull: pulsations reduced to 10 mV 100 Hz, but this caused overloads during short circuit mode and leaded to duration of overload current up to 5 ms.
Any ideas why in CC mode I have such high pulsations? Also, I do not understand why in simulator pulsations are within normal range, but in reality they are too high. I tested the circuit but it doesn’t work as expected. The voltage on the output has a max value 25V instead of 30V. The x3 gain of U3 seems to work fine as far as input is less than 8,3V (3 x 8,3 = 24,9V). But when input is more than 8,3 V the output of U3 stays at 25V. Any suggestion what is the fault element??? Check values of transformer secondary winding and Vcc of U3. Probably 25 volts is the max value of U3 output due to Vcc limit. With which software you have drawn the scheme? Here is the original article in practical electronics. Starts on page 40.